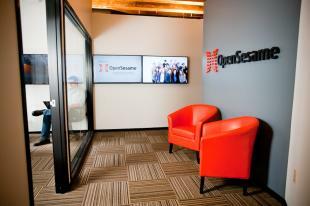 After three years in the Portland State Business Accelerator, OpenSesame has a new office to call home! Our new 4,600 square foot office is located in Old Town, which is exactly what Josh Blank, OpenSesame’s vice president and co-founder, was looking for. “We wanted to be located in a vibrant part of the city,” he noted, with plenty of amenities within walking distance and easy biking and public transit access. He also added that we were looking for a place that could accommodate our expected growth for the next couple of years. Another important feature we were looking for was a place that could provide both an open office environment as well as private places to work, as Josh acknowledged OpenSesame understands the open office environment is not everyone’s perfect match and wants to be able to provide those people with more private work areas. The office we’ve moved into supplies all those things and more, and Josh is ready to tell you just a few of his favorite aspects about the new office. He loves the look of the office, the old brick walls and wooden beams create a unique juxtaposition with our bright orange couches and modern flat panels TVs. He also really enjoys the visibility to real time information in regards to how all the teams are doing everyday. Along with both of those great perks of the new office, Josh says his third favorite aspect of the new office is the location amid other startups, such as Simple and Airbnb, who are just down the street from us! Overhead view of our new digs! Brittany and Kristin work on a project. Maximus prefers a standing desk. Katie and Abby know the best places to sit. Max demonstrates our sweet new bike storage!